Children's animated films may be designed purely for children's entertainment, and very few manage to transcend to the level of "work of art." This film is not one of them. First of all, there's the star-studded voice cast. Now it is a general rule in Hollywood that the number of famous names in an animated film voice cast is inversely proportional to the quality of the animated film. So if you know more than five well-known names doing the character voices, there's a huge chance that the film will not give you your money's worth. You may be entertained for two hours, but the true test of a film's entertainment value is its ability to entertain you well after you leave the theater. John Cusack plays Igor, a stereotypical hunchback assistant to a raving mad scientist. The whole movie can be summarized in the caption on the movie poster: All men are not created evil. Of course they're not. This is simply a story about someone confronted with a choice between doing good and doing evil. And we all know how this turns out in children's films. The funniest lines from the movie, strangely, do not come from Igor, nor from his huge monstrous creation Eva, but from his two sidekicks Scamper and Brain (misspelled as "Brian"), who are voiced by Steve Buscemi and Sean Hayes, respectively. Buscemi's annoying whiny voice is perfect for the witty Scamper, while Hayes's senseless remarks will delight both kids and adults. The thing that disappoints me in this movie is the fact that it looked too much like a Tim Burton rip-off, especially with the character of King Malbert (voiced by Jay Leno), who looks uncomfortably like the Mayor from The Nightmare Before Christmas. Also, the characters are designed in a very Burton-esque style. It may be understandable if we consider that this is the first animated venture of Exodus Productions, but in order for this budding company to take on the likes of giants Pixar and Dreamworks, it has to break new ground. 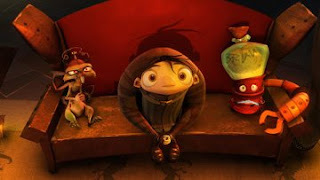 Yet despite the superb animation provided by the French studio Sparx, this film hardly impresses us with anything original. And to count off the famous names doing the voices: There's John Cusack, Steve Buscemi, John Cleese as the evil scientist Doctor Glickenstein, Jay Leno, and Christian Slater as another Igor. That's five. And then there's Arsenio Hall as the invisible Carl Cristall. That makes six. And like I said, more than five famous voices usually means that the film will not be good. Usually, but not always though. There are exceptions. And this film is not one of those exceptions.